When counting macros, hitting the calculated protein recommendation is often difficult for many. It is perhaps the number one difficulty that my coaching clients report. They get frustrated when they can’t reach their protein target without going way over on their fat or carb goal. Therefore, it’s not a matter of just telling them to “eat more meat”. But instead, it’s teaching them to choose the correct sources of protein so that their other macros don’t suffer the consequences. 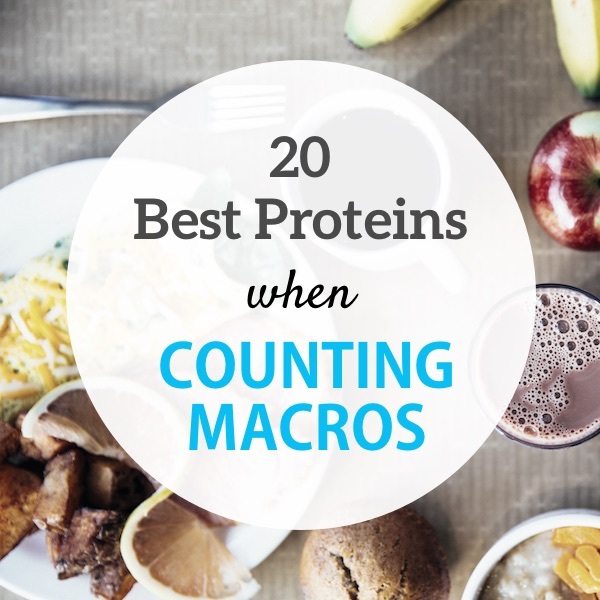 In this article, I’ll list the 20+ top protein foods to use when counting macros so that you can satisfy that macro with the least impact to the other macros. *Most of the items are raw weight unless the item typically comes precooked or ready to eat. The daily protein requirement is often debated among fitness professionals and there are a lot of myths around figuring out an optimal daily amount. But, in general, most people believe they need to eat more protein than they actually do. The RDA (recommended daily allowance) for protein is .8 gram of protein per kilogram (kg) of body weight or .36 grams per pound. This is considered the minimum amount and based on the individual being sedentary. Therefore a sedentary man who weights 180 pounds would need to eat 64.8 grams of protein a day. That’s a far cry from what many believe, which is a person should eat one gram of protein per pound of body weight. It’s not that this is completely false, it’s just not a rule for everyone. This “rule” is actually a bodybuilding rule and was intended for bodybuilders who are bulking up and adding more muscle by doing intense weight training. How Should I Calculate My Protein? How much and what kind of exercise you are doing. Your goals: Weight loss or weight gain. When constructing our macro calculator, we recognize that most people can benefit from more protein than the RDA of .36 per pound of body weight, so we calculated for three optimal protein settings. Moderate (.65 gram per pound) is good for sedentary individuals that are wanting to lose weight. This is also an appropriate amount on a rest day and this would also be appropriate for obese individuals. If a five-foot-three-inch woman weighs 220 pounds, 143 g of protein is more than adequate given her estimated lean mass, even with exercise factored in. High (.82 gram per pound) is appropriate for most people who are engaged in moderate exercise and have an average body fat percentage. Maximum (1 gram per pound) is appropriate for those that are wanting to gain weight, have a low body fat percentage, and are engaged in intense weight lifting. Also, athletes who are extremely active can benefit at this level. You can also customize your protein as long as you know your body weight or Total Daily Energy Expenditure (TDEE) with some simple math. Say you just want to eat a certain percentage of your diet as protein. 25-35% is usually an acceptable range depending on lean mass and lifestyle factors. I think paying attention to the quality of the protein you are eating does make a difference in your overall good health. Do you really want to eat a chicken breast that’s laced with growth hormones and antibiotics? Do you want to eat fish that has high levels of mercury in their muscle tissue? Understanding where your food comes from and how it is produced/caught is important and trying to choose clean protein sources when possible is also important not only for your health but also for the health of the planet.